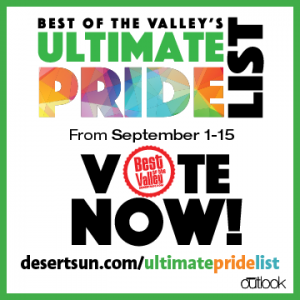 For the second year in a row, Desert Sun readers have nominated their favorite LGBT-friendly places, businesses, and events in Coachella Valley for the Best of the Valley’s Ultimate Pride List. On the list for 2016 – Revivals Stores, Desert AIDS Project, and the Steve Chase Humanitarian Awards Gala! We’d be honored to have your support by voting for Revivals Stores, Desert AIDS Project, and the Steve Chase Humanitarian Awards Gala daily until September 15! Vote for Revivals Stores, Desert AIDS Project, and the Steve Chase Humanitarian Awards Gala here! The very first Revivals store was opened in 1995, in a back corner of the Desert AIDS Project office on Vella Road. Since those earliest days, the funds raised through selling donated goods at Revivals have supported support client services at D.A.P., while also providing a great volunteer opportunity for those who want to support the organization with their time and retail talents. Today, all of the stores are largely volunteer-run, enabling Revivals to make a significant financial contribution to the annual budget of Desert AIDS Project. Desert AIDS Project (D.A.P.) is a Federally Qualified Health Center that offers primary care, HIV and hepatitis specialty care, dentistry, and behavioral health all-under-one-roof. On World AIDS Day 2015, The White House recognized the success of D.A.P.’s Get Tested Coachella Valley campaign, the nation’s first region-wide HIV testing and access to care initiative that is helping to bring about an AIDS-free future. Since 1995, the Steve Chase Humanitarian Awards Gala has raised millions of dollars for direct client services at Desert AIDS Project. First organized by and named for famed interior designer Steve Chase, these galas are a prime highlight of the desert community’s social season! Congratulations to all of the nominated businesses, professionals, and organizations. To vote for Revivals Stores, Desert AIDS Project, and the Steve Chase Humanitarian Awards Gala, please visit http://desertsun.secondstreetapp.com/l/Ultimate-Pride-List/.